Published November 19, 2018 Disclosure: We may receive compensation if you sign up for or purchase products linked to below. We try our best to provide the most accurate information, but details do change. Please refer to the company website for the most up-to-date information on any lead or recommendation. In our increasingly connected world, the idea of an office and working environment is taking on many different shapes and sizes. Many spend their time on the road, running their operations from hotel rooms, coffee shops, the carpool lane, and any place they can find a Wi-Fi connection. Perhaps some keep a home office and spend the rest of his or her time hitting the road. These types of folks can often prove to be a challenge to shop for. Whether you’re shopping for a family member, a friend, or yourself, you’ll find some great gifts for people who work from home and/or on the go below. One of the gift suggestions I am most excited about this year is the Spire Stone. I first saw this product in an Instagram ad and had to have it. Many of us who work from home suffer from high anxiety. For myself, learning to recognize the first signs of an anxiety attack has been paramount to halting that vicious circle of falling off that cliff and spending days at the bottom. If I can catch myself before I get to the edge and redirect, I can prevent that vicious cycle. The Spire Stone was developed based on years of scientific research. It measures your breathing and senses change in your movement that could be a sign of tension. The Stone will vibrate if it senses several minutes of tension. The app will then show a breathing exercise that can help you calm down and find focus. It also helps you track the duration of calm, tension, focus and activity during your day so you can identify any repetitive cycles. I love it SO much! Bonus: The Spire Stone tracks activity. It can let you know how many steps you are – or aren't – taking each day and vibrate if you've been sedentary too long. Us work-at-homers need a good reminder of that! And, it is washable. If you forget to unclip it and it makes it to the washing machine, no biggie! Each charge lasts 5 days. A wireless charger is included. 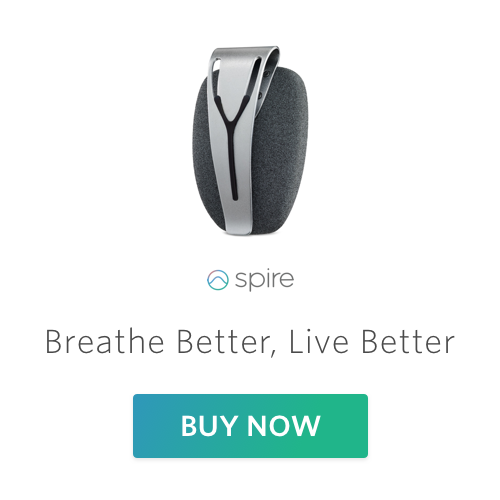 November 19 – 26 Get $30 Off Spire Stone. No Code Needed. The next item on my gift wish list was the UPRIGHT GO Trainer. I have really bad posture, and a slight case of scoliosis, which causes me a lot of discomfort working at a computer all day. The UPRIGHT GO is a wearable posture trainer. It's been validated by several clinical studies and is recommended by over 100 clinics in the U.S. and around the world. So far, they have sold more 150,000 units and over 87% of users report improvement in their posture within 2 weeks of training. The device is super easy to use. It sticks right on your upper back with a little adhesive strip. When “training,” the device will vibrate whenever you start to slouch. When “tracking,” it will simply collect data over time which can then be viewed on the free smartphone app. You do a little training and a little tracking every day. The little vibration is a lot less annoying than my husband constantly saying, “stand up straight.” And I appreciate any opportunity to alleviate a little back pain! When you’re working from home, security of your data and the data of your clients should be a priority. This router offers great Wi-Fi performance, so that all connected devices can get the best in signal strength in and around the home. The integrated security will keep the Wi-Fi network and all devices protected from outside threats. This is a great choice in gift for the person who works at home, particularly if they have children. Built-in parental controls allow for easily monitoring what kids are doing on the internet, and also control what they do have access to. This secure router offers a great number of features that the busy on the go professional will thoroughly appreciate, including the ability to create guest networks and keep on top of the security needs of the whole home. Working on the go or working at home, you need the right tools on hand. A portable mouse is a great stocking stuffer for the busy professional. This mouse is portable, durable, and offers universal compatibility so it’ll work with just about any laptop and device. It’s easy to get started with this mouse, simply plug in the USB receiver its ready to be used. The portability of this mouse means that it can be popped into a laptop bag when on the go, and can be instantly ready to be used when settling down to work. It’s offered in a number of designs so you can pick out the right one for that special someone in your life. Whether on the go or spending hours behind a desk, this portable thermos is a thoughtful gift for any number of people. For the person who is working at home or taking work on the road, this thermos will keep food cold to up to 8 hours, and warm up to 6 hours. Whether fruit and yogurt, or a warming winter soup, this thermos will get the job done. The stainless steel design is practical, but also just simply great to look at. The cork topper will keep the contents secure, while the spoon clips on easily. This is a terrific gift idea, but be sure to get one for yourself too. The Kindle is a must-have for the reader in your life. Whether working at home, hitting the road, or enjoying a well-deserved vacation, there’s nothing quite like enjoying a good book. The Kindle offers access to an immense library of books, but also offers access to the latest in news and magazine features. The battery will last for weeks at a time, which is ideal for the person who may not necessarily remember or be able to charge it. Waterproof means that it’s just that much better for enjoying on the go. Ample storage space means that there’s no risk of running out of room for those favorite books or periodicals. Be sure to include the Kindle Unlimited subscription so that your special someone will have unlimited access to some of the best that Kindle and Amazon can offer. With a long comfortable and padded shoulder strap, this laptop bag is a great choice for the busy professional on the go. It’s offered in a selection of sizes and colors so that you can get just the right one to match not just the device but the personality of your gift recipient. The interior pockets of the bag offer good protection for a laptop or tablet, while also offering plenty of room for a day planner, phone, charger, and all of the other essentials needed while on the move. The professional on the move needs a bag that is practical and spacious. This bag definitely fits the bill, while offering a trendy and contemporary design to it. Let’s face it, even working at home some of us are prone to losing our keys or tablets or any other number of important devices. Tile can help to quickly locate these misplaced items, and make life a heck of a lot easier for the person who is on the move. Lost your laptop somewhere while you’re visiting an off-site location? Use Tile to track down the laptop in almost no time at all. Keep one on your luggage when you’re traveling, or clip it onto your laptop bag. Lost your phone? Simply double-tap the Tile device and your phone will start to ring. This is a versatile and multi-purpose essential for the busy traveler and work from home professional. We’ve all been in that semi-panicked state because the battery in our phone is nearly wiped out, and we need to find a charger ASAP. This power bank is a great choice for your work from home or on the road special someone. It can readily charge a smartphone to full capacity in almost no time at all. The multiple USB ports allow for the charging of multiple devices. Perhaps one of the best features of this power bank is that it is, itself, rechargeable. This makes it the ideal choice for the person who is constantly on the road without the ability to stop and charge a device. It’s got a built-in LED flashlight, which is an added feature that is sure to come in handy. Whether working exclusively from home, or working on the go, a washable keyboard is something that every business professional can appreciate. This keyboard has been designed with durability in mind, and has been built to stand up to the use and potential abuse that it may see while it’s on the road. The keyboard is lightweight and easy enough to slip into a larger bag when on the go. It can easily be dunked into a sink of water and rinsed clean if it happens to get sticky or falls victim to a knocked over cup of coffee.